A photo that has since been making the rounds, Tharoor can be seen in a blood-soaked yellow kurta with bandage on his head. Congress leader Shashi Tharoor received six stitches on his head after he was injured while offering prayers at a temple in Kerala's Thiruvananthapuram. Tharoor was performing the ritual of 'thulabharam' when he suffered the injury. He was rushed to the hospital immediately, where he was given six stitches. 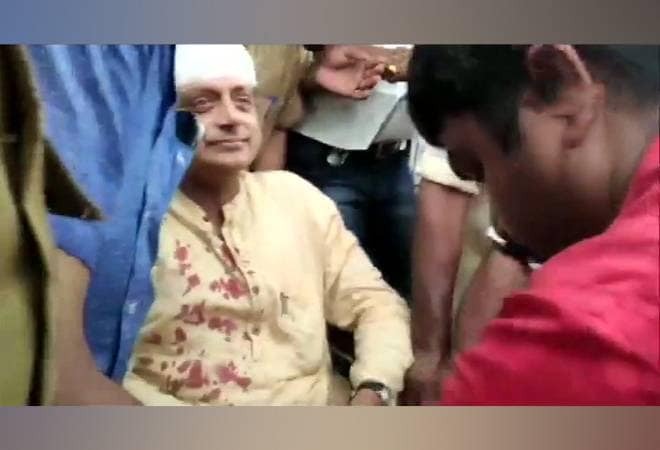 In a photo that has since been making the rounds, Tharoor can be seen in a blood-soaked yellow kurta with bandage on his head. Thulabharam is a ritual where a devotee is weighed on a scale against offerings including fruits and sweets. Kerala is celebrating Vishu or its new year today. People from across the state visit temples to offer prayers on this day. Tharoor who is the Congress candidate from Thiruvananthapuram Lok Sabha seat is looking for a third term. Kerala will vote in a single phase polls on April 23. Results for the Lok Sabha Election 2019 will be declared on May 23.